KRISP researchers Upasana Ramphal and Dr. Marcel Tongo scooped two of the three awards at the Wellcome Trust DELTAS SANTHE research day held on the 6 - 7 June 2018 at Crinkly Bottom in Waterfall, South Africa. 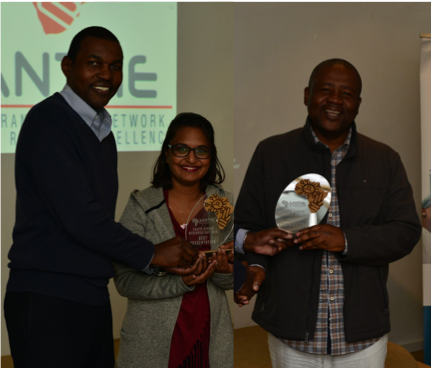 Prof. Thumbi Ndung’u (left) gives the awards to Upasana Ramphal and Dr Marcel Tongo at the SANTHE Research Day, 6-7 June, South Africa. - Best Contribution – Dr. Marcel Tongo. In addition, Saiyuri Singh and Upasana Ramphal also obtained two SANTHE travel awards to attend training and execute part of their MSc work at the Texas Biomedical Research Institute in San Antonio, Texas under the mentor-ship of Dr Smita Kulkarni and Dr Veron Ramsuran.